September 23, 2017 - You don’t have to go far from home to observe the splendours of nature, writes Mark Robertson. Hooded plover nests can be very difficult to see. THE hooded plover breeding season in Bass Coast is off to a bad start, with not a single chick surviving to fledging so far. Last breeding season saw good results compared to previous seasons, with 40 chicks surviving the summer conditions and crowds and making it to fledging, or the flying stage. This season we have had a total of 28 nesting attempts on beaches across the entire shire. So far, only two nests have made it to the hatching stage and no chicks have survived to date. That means 84 eggs have been laid and no chicks have lived beyond a few days. The hooded plover is a vulnerable species in Australia and endangered in Victoria. Due to the breeding habits of these birds, it is very easy for them to be disturbed by people and their pets without people even knowing. It takes four weeks to incubate the eggs till they hatch, and a further five weeks until the chicks can fly and therefore avoid danger. This is a long time to spend exposed on beaches with threats to their survival coming from storms, extreme heat, high winds, foxes, ravens, cats, people, dogs and numerous other elements. 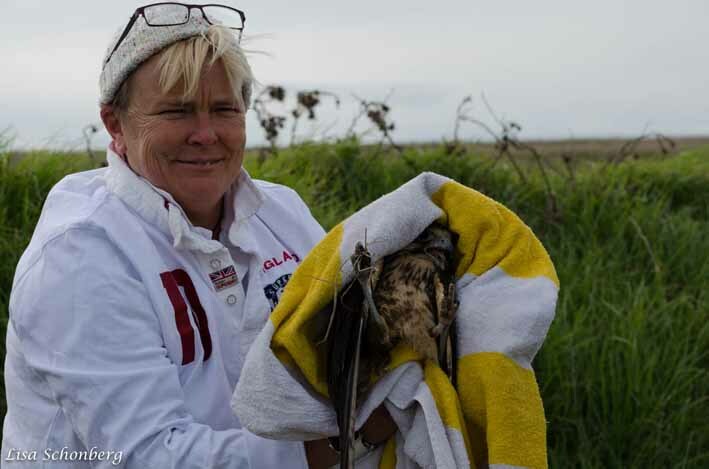 Bass Coast Shire Council’s manager of sustainable environment, Deirdre Griepsma, said the good news is there are a few easy steps people can take to help out these birds by providing space for them to have a nest and raise a family. She said that while we can’t control the weather and some predators, we can influence the way our community and visitors behave. "Hooded plovers nest in the foredunes on our beaches, as they are extremely well adapted to living on the beach. They forage at all levels of the water on a variety of food, such as sand hoppers, molluscs, insects, worms and seeds from aquatic plants. Report any incidents to the council on 1300 226 278 or 5671 2211. IT’S impossible to know how you will react to seeing a whale until it happens. Some people can’t stop talking. Others are gobsmacked. Others burst into tears. Renee de Bondt has seen it all since she’s been crewing on whale watching cruises with Wildlife Coast Cruises. While the company has operated wildlife cruises for about 20 years, it’s only in the past few years that they have operated whale tours. Passenger numbers are growing with the reputation of Bass Coast and Phillip Island for whale sightings. The company is also building expertise with crew members becoming much better at knowing where to look for whales. This year the company employed about 20 people during winter, the traditional down season for Bass Coast and the island. The boat carries 90 people on the four-hour voyage and is often booked out during the season, which runs from mid-June to early August. The passengers are a mix of locals and visitors, including many from overseas. It’s a far cry from 2009 when Victoria’s Department of Sustainability and Environment and federal Environment Minister Peter Garrett were insisting that Bass Coast was not an important area for migrating whales. The reason? They didn’t want anything to derail plans for a mammoth desalination plant to be built at Williamsons Beach, between Dalyston and Wonthaggi. An environmental effects study for the proposed plant claimed that over many years only one whale had been spotted in the vicinity of the project site. He was one of the founders of Whalewatch. 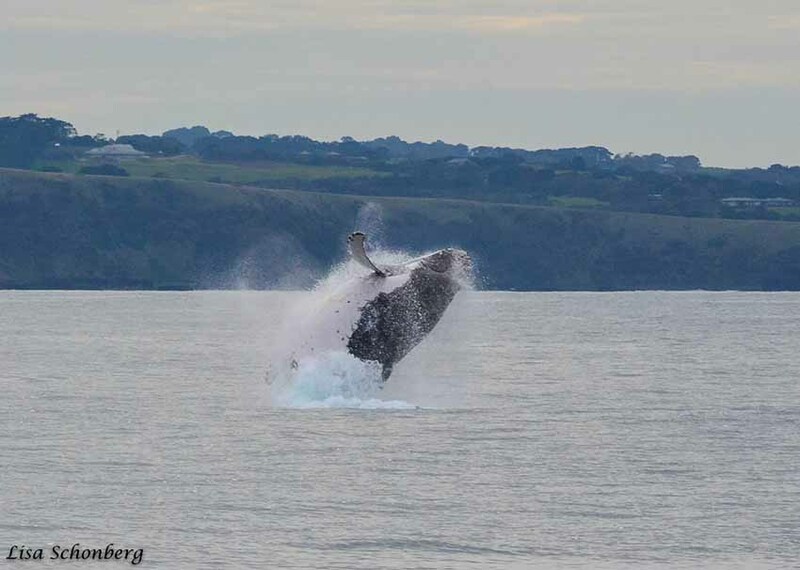 In the first year, there were sightings of 133 humpback whales and 18 southern right whales along the coast. Another 93 whale observations were unable to be identified. On top of that, nervous surfers spotted a handful of killer whales and a great white shark, and some 220 dolphins were seen in pods up to 50. The Whalewatch site has operated ever since, recording sightings and alerting locals to good spots to see them. Mark says that six years later, the state’s Department of Environment, Land, Water and Planning is still belittling local sightings, arguing they are not scientific, but they cannot argue with the visual evidence. He gives special credit to two local photographers, Geoff Glare (on the mainland) and Lisa Schonberg (on Phillip Island) who have amassed evidence of major whale movements in the area with thousands of photos. He says the whales appear to navigate from headland to headland (Cape Woolamai, Cape Paterson, Cape Liptrap) though occasionally coming in closer to shore. His own favourite whale watching spot is on the Cape Paterson cliffs. Mark says he’s delighted by the turnaround in public perception and the growing education of the local population about these giants of the sea. Bass Coast Mayor Jordan Crugnale paid tribute to the tenacity of local groups and individuals who had advocated for the project for many years. Representatives of Whalewatch Gippsland will meet council officers next week to discuss locations and signs, which will be particular to each area. LAST week I found an injured falcon on the side of the road. I immediately called Wildlife Rescue and Carer Shelters and Kaylene was at the scene within 10 minutes. Sadly the bird had sustained internal injuries and didn’t make it, but it was not left to die a painful death. The founders of this wildlife rescue service, Kaylene and Colleen, help rescue injured wildlife and pay for all own expenses. They are truly amazing women with many stories that would break your heart. Now they are on the verge of having to shut down their service due to lack of money and constant demand to rescue injured wildlife on Phillip Island/Bass Coast. I am hoping the Post and its readers can help Kaylene and Colleen keep performing their wonderful service for our wildlife. If you would like to help, visit https://www.facebook.com/Wildlife-rescue-carer-shelters-phillip-island-1561330967450242/ or call Kaylene on 0412 258 396. 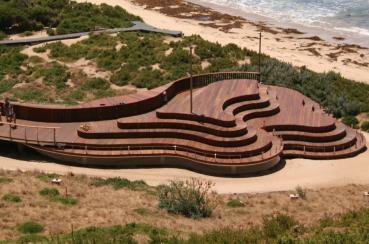 THE new Penguins Plus viewing platform is a contender in this year’s Victorian Architecture Awards. Penguins Plus Viewing was designed by Wood Marsh Pty Ltd as part of a joint venture between Phillip Island Nature Parks and RACV. The architectural response was inspired by the natural elements of the surrounding landscape referencing the coves of the coastline to offer the visitors personal viewing of the penguins as they make their way along the natural pathway. The bunker below provides a protected, theatrical, eye-level view of the crossing, sited within the natural contours to nestle in the surroundings and avoid the use of balustrades to achieve unhindered views. Sculpturally the form stretches along the embankment, following the creek as a sinuous, organic element. Designed to weather to a natural grey and recede into its surroundings, the design sits like a piece of weathered, eroded driftwood in the landscape. Penguins Plus is a finalist in the Small Project Architecture Award. 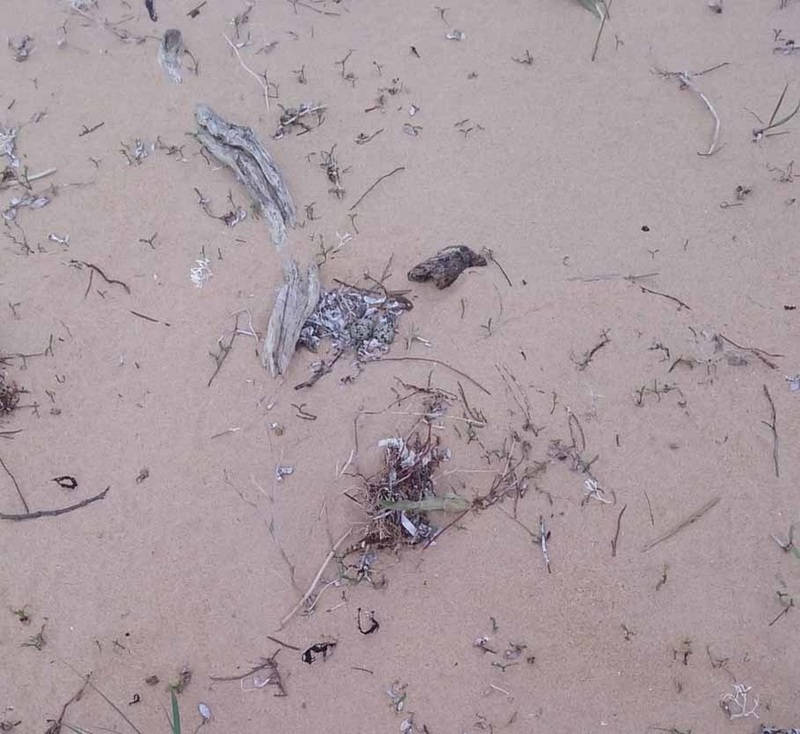 Has Ed Thexton’s dog trampled on any tiny hooded plover chicks? He doesn’t know for sure, but these days Point Norman and Screw Creek are off his dog walking map. A chick or egg are collateral damage to a joyful, bounding dog on a beach. I SPENT Tuesday with the community volunteers and local staff of Holcim (formerly Readymix) at the BirdLife Australia threatened bird network workshop at Inverloch where Renee Mead from the beach-nesting birds program was a guest speaker. What a place Inverloch is! Four beach-nesting birds, three of them vulnerable, nest at Point Norman. Right in town! When the solitary beach stone curlew was here last year – well out of its natural range – Inverloch was a mecca for bird watchers, some from as far away as Sweden. We have all heard of the hooded plover (eastern), which is also nesting at Screw Creek this year. The adult is about 20 centimetres long and weighs about 100 grams. There are now only 550 to 600 birds left in Victoria. Last year, following a rigorous scientific assessment of the species’ threat status, the hooded plover was listed as threatened under the Vulnerable category of the federal Environment Protection and Biodiversity Conservation Act. It joins the other two vulnerable species that nest at Point Norman, namely the pied oystercatcher and little tern. No wonder their population is declining. For every 100 eggs laid, only two make it to the start of adulthood. How crazy is its reproductive strategy? And yet life on a beach makes some sense: twice daily the tide delivers a fresh meal and on the beach you can see the predators coming. That explains why they nest out in the open. If they make it through the 28 days of egg incubation (a 23 per cent chance) and the 35 days from hatching to flying (a 20 per cent chance) they can expect a long life in the sun. Who would expect such a small bird living in such a vulnerable open location to live to the ripe old age of up to 16 years? Recognition of the beach nesters is a recent phenomenon. We didn’t hear about them growing up. The first pilot study of them was only in 2006. Since then, Birds Australia has brought science and martialled an army of eager citizen volunteers to develop our understanding. This is evidence-based science gathered directly. Advances in motion sensor cameras have revealed the predators, the vulnerabilities, the habits and the life stages. No wonder 98 out of 100 die. The cameras have shown that if the king tides, storms and sand don’t wash, blow or bury the nest, if the relentless summer sun doesn’t cook the eggs or dehydrate the tiny little chicks, if the hawks, gulls, maggies and crows – not to forget the foxes – don’t eat them, they might survive. Then there is us. Everyone loves the beach, don’t they? I swear you will never see those beautifully, exquisitely fit-for-purpose camouflaged eggs and chicks. But your dog just might. People and dogs compound pressure on the eggs and chicks. The good news in Victoria is that at least we don’t allow cars on the beach. The other good news is the volunteers. It is the volunteers who put up the signs and fences, monitor the nests and shift the fences. They shift the fences because on hatching the chicks are highly mobile and head for the waterline where the food is. Of course the fences can’t survive the waves of the incoming tide so are never located there. The single line fences are generally located around the nest areas. They provide space enough when people and their dogs remain outside the roped area so that adult plovers are not continually flushed from their nest. The fences, like the signs, are designed as indicators for the beach visitors. In the volatile beach environment, providing protection for a highly mobile bird species with a more robust fence is quiet simply impractical. Once hatched, the tiny chicks feed themselves, always on the beach. They are so small they can easily hide in a heel print. They begin a 35-day marathon until they can fly, their camouflage and expert hiding skills their only defence. They define the term vulnerable. Only one out of five will survive to fly. They need all the help they can get. We can’t do anything about the weather and tides although school kids make shelters that are placed by volunteers. The beach provides such rich pickings that increasingly the smart birds – ravens and magpies – have taken to feeding there, including on chicks and eggs. And control of town foxes is rightfully constrained to prevent poisoning of pets. Of the things we can control, it is ourselves and our dogs. Our own dog is a beautiful border collie. At two and half, she lives for pats. Not a malicious bone in her body. But a chick or egg are collateral damage to a bounding, leaping dog. Their loss would go unnoticed by us or them. I couldn’t tell you if we have killed any. Knowing what I now know, and which I am attempting to share with you, my fellow dog owners, Point Norman and Screw Creek will be off the dog walking map from now on. It’s just too hard to enjoy yourself while looking for a chick that is so small it can hide in a heel print. Simply not worth it. Dogs and plovers don’t and can’t mix. Dogs win. Plovers lose. It’s that simple. For the sake of the declining population of hooded plovers and the three other beach nesting birds, please take your dog anywhere else but Point Norman or Screw Creek, and well away from fenced off areas. Dogs can run on a park or an oval on many other sections of beach. The birds have no options. If you think this is just the bleating of another bunch of superannuated beach lovers with nothing better to do, maybe you should reconsider. Threatened species recovery is serious business. Serious for big business. The staff from the Leongatha quarry of Holcim (Readymix) were at the workshop in force. Holcim is a major sponsor of BirdLife Australia’s threatened bird network. Beach-nesting birds are an asset for Inverloch. Point Norman is unique in Victoria because of the four species of beach-nesting birds. Otherwise it is just another sandy stretch of beach. I would be more than glad to have you join us to see what all the fuss is about. We have high-powered specialist tripod mounted bird spotting scopes which really bring the beauty of that distance spec to life. 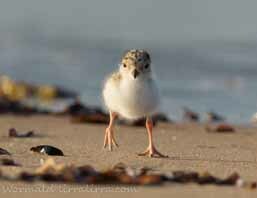 The tiny hooded plover chicks are virtually impossible to see on the beach. ​It wasn’t a dog. It wasn’t a cat. Almost 20 years later, NOLA THORPE still wonders what she saw that day at Bald Hills. The Wonthaggi Express, June 28, 1956. 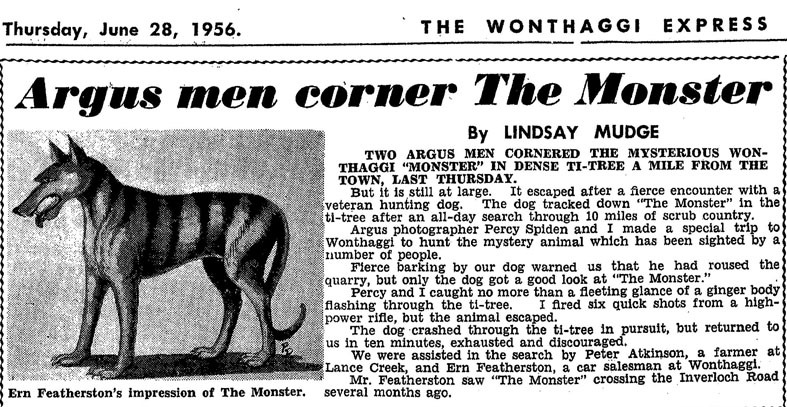 In the 1950s and 1960s, the Express carried dozens of reports of mysterious sightings of an animal it dubbed 'the Monster'. This particular Saturday our walk took us down to Bald Hills, near Lower Tarwin. We had walked the length of the road down to the wetlands and were on our way back to where we had left our cars on the Walkerville Road. Suddenly an animal ran across the road a hundred yards or so in front of us. It stopped us all (a dozen or so) in our tracks as we tried to make out what this animal was. In the short time it was in view there were many opinions offered but it quickly disappeared and people lost interest and continued walking. Julie, Penny and I were more curious and crossed to the farm fence where it had gone into the paddock. Luckily Penny and I had binoculars for birdwatching and we soon spotted it about a football oval distance away sitting calmly in the sun. It was short-haired and the colour of dry bracken fern with a different shade across the rump and a long dark tail. It was about the height of a labrador but longer in the body so it looked badly proportioned. It was facing us and we could see that its forehead was quite broad. It had small rounded upright ears which almost gave it a lioness look. It sat on its haunches and scratched behind its ears, just like a cat washing itself. We watched for several minutes until it loped off into the scrub. We compared notes and were able to verify each other’s ideas. When I got home I wrote down all the details while they were fresh in my mind I also remembered that I had filed a double paged article from the Sunday Age of 2/6/97 which reported at length on the various sightings of thylacines in the Gippsland area. When I got to school on the Monday I couldn't wait to get to the file. The descriptions given in the article fitted exactly with what we had seen on the Saturday. Perhaps we really had seen a thylacine. It was so hard to believe. How could it be? It defied all logic. I have heard since that there may have been some animals released years before at Wilsons Prom but I don't know if that's true or not. I have also been told of sightings up in the hills at the back of Foster. I will never forget that day and I still have a very clear picture in my mind of what I saw. I had never seen anything like it before. I hope it was a thylacine. Have you seen a thylacine or something that made you wonder? LAST year’s hooded plover breeding season at Kilcunda was dispiriting for volunteer “hoodies” who saw every nesting attempt by their birds preyed upon by foxes. This year, the hunters become the hunted, with the council running a local fox control program to improve the breeding chances of the beach-nesting bird, which is down to about 500 breeding pairs in Victoria. Starting in the second week of December, a licensed contractor will undertake trapping in the area between the Trestle Bridge and Cemetery Point for one week. Soft jaw leghold traps will be used and checked early each morning in line with regulations on the prevention of cruelty to animals. The traps will be positioned in remote bushland sites away from the beach and defined access tracks to reduce risks to dogs. Signs on formal access tracks will warn of the program and the need for owners to keep their dogs on a leash at all times. There is little risk of humans being caught in the small soft jaw traps. The Friends of the Hooded Plover Bass Coast group are supporting the program, and the Department of Economic Development, Jobs, Transport and Resources has advised on permit requirements. 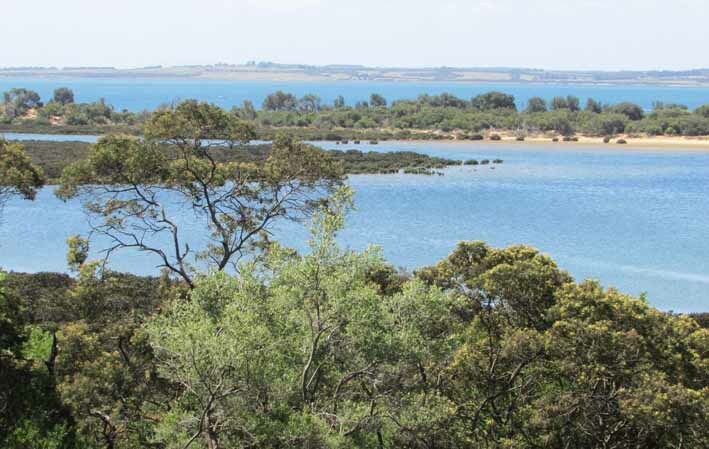 A group of visiting naturalists have wonderful memories of a recent visit to Phillip Island. In November, the Ringwood Field Naturalists Club travelled to Phillip Island for their spring weekend camp. Based at Ventnor at the western end of the island, members were soon exploring the nearby beaches, where the basalt wave platforms were carved into colourful and fantastic shapes by the continual action of wind and waves. We admired the variety of marine algae and watched a group of gannets plunge repeatedly into the waves for fish. A visit to the Nobbies provided the opportunity to observe a variety of bird life as nesting seabirds cared for their chicks on the windswept cliffs. Later we travelled inland to explore the wetlands at Swan Lake and from the bird-hides overlooking the mud flats we enjoyed watching swans, ducks, dotterels, plovers, Australasian coots, Cape Barren geese and egrets displaying their natural behaviour undisturbed by our presence. 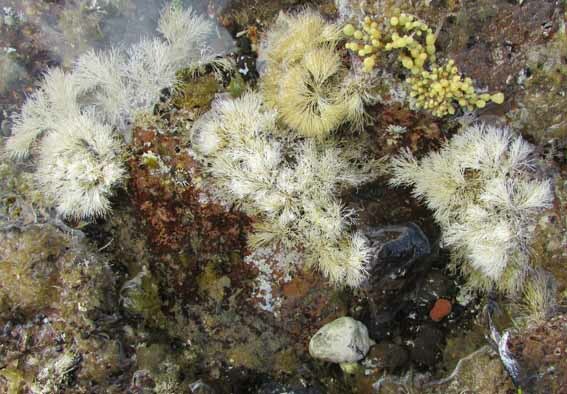 Our Sunday morning expedition to Angelina Reef at low tide revealed a wealth of marine organisms and cameras clicked frequently as every pool decorated in its own distinctive arrangement of different seaweeds disclosed fresh surprises, including sea stars, crabs, sea urchins, sea snails and much more. On Sunday afternoon we relocated to the other end of the island where a visit to Rhyll lookout offered a scenic ramble along the rim of the escarpment with distant glimpses of tranquil sandbars and mangroves surrounded by turquoise shallows sparkling in the sun. The nectar-rich flowers of local eucalypts attracted numerous honeyeaters eager to exploit this bountiful food supply. A common brown butterfly perched momentarily on a gnarled and twisted tea-tree branch and a sleepy copperhead casually vacated his sunny position to allow us to pass. At the conclusion of an adventure-packed program we reluctantly returned to the mainland with a host of wonderful memories from our brief stay in this fascinating region. Judith Cooke is a life member of the Ringwood Field Naturalists Club. BASS Coast Council recently issued a permit to a private operator to use the beaches from Kilcunda to Cape Paterson to run bike tours. These are no ordinary bikes but “fat bikes” with wide tyres that allow them to move easily and quickly along the sand. What’s more, these are no ordinary beaches but the breeding sites of extremely vulnerable hooded plovers. Council staff issued this permit without the involvement of councillors and without any invitation for public comment. As more and more residents and visitors to Bass Coast appreciate, these little birds are precious. They are already extinct in Queensland and almost extinct in NSW. Only about 500 are left in Victoria. Last year the federal Environment Minister upgraded their conservation status in response to their increasingly perilous situation. The application for the permit by the local operator should have triggered a referral under the EPBC Act. However, this did not occur. If it had, a particular question would have had to have been answered. The question is: Is there an alternative to the proposed action? (ie. riding through the hooded plover breeding sites) And the answer is: Yes. The alternative is the use of the Rail Trail which runs above the beach (and joins with bike tracks and lanes all the way to Cape Paterson) and is purpose-built for the activity for which the permit was being applied. Instead council staff approved the permit and included a number of “special conditions”. These conditions are grossly inadequate. They do not fully consider the nature of the birds’ behavior and the impact of the disturbance these bikes will have on the birds and their breeding habitat. For example, while the hooded plovers’ nest (which they leave as soon as they hatch) is up above the high tide mark, the chicks need to feed at the water’s edge where the birds’ main food source is. This is also the area – the intertidal zone – through which the bikes will be ridden. One special condition states that cyclists must “slow down if you see a sign or fence on the beach to give chicks a chance to run and hide”. Actually, chicks do not always run away when they see a threat. In fact, they will very often drop down and hide against the sand or beneath a tiny bit of seaweed. This, of course, means they are at great risk of being unseen and run over by one of the bikes. Hooded plover chick, Grossard Point, Ventnor, October 2015. Photographer: Kim Wormald. ​The council’s general manager of sustainable development and growth, Allison Jones, says the 12 month foreshore use permit for "Fat Bikes" to operate sporadic bicycle riding tours along the beach between the Kilcunda trestle bridge and the Cape Paterson Surf Life Saving Club was issued in consultation with the Friends of the Hooded Plovers Group and Parks Victoria, which had considerable input into the conditions of the permit. The council does not prohibit people riding bicycles on the beach under its local laws. However, all commercial activities on foreshores are governed by the council’s foreshore use policy. Ms Jones said the conditions on the permit address environmental concerns that may arise from this activity, and include protection of hooded plover nesting areas, vegetation and dunes. She said that under the EPBC Act the proposed activity must be of a certain magnitude in order for it to be considered an impact under the Act, and referred to the Minister. The activity of riding bicycles would not be considered a significant impact, especially given the conditions that we have put on the permit. The permit conditions mirror Parks Victoria’s conditions due to our coordinated approach to issuing this permit, and were developed in consultation with the Friends of the Hooded Plover. Secondly, the chicks can and do travel quite a distance from the nesting area where the signs and/or fences are. This means that the chick may be nowhere near a sign or fence. Thus, the bike riders will not know to look for the chicks in the area where the chick actually is. ​What’s more, the chicks are so tiny and so well camouflaged that even the most expert of hooded plover observers would find it difficult to see them, let alone novices riding along at a certain speed on a bike. It isn’t just the danger of riders making contact with a chick but also the level of disturbance these bikes create for the chicks and adults alike, even when the birds are up on the dry sand. If a person walks carefully along the beach, the birds will be disturbed to a minimal extent; if a jogger goes along the beach the birds are disturbed more; if a bike (or worse, group of bikes) goes along the beach the birds are greatly disturbed. A high level of disturbance not only stresses the birds at the time but can lead to them moving away from that particular breeding site. Without doubt, a high level of disturbance – which is what these bikes present - will affect the birds’ breeding success. Finally there arises the obvious question: who will enforce these special conditions? Will there really be council rangers observing from Kilcunda to Cape Paterson every third day or so when these tours operate? Of course not. It’s frustrating and sad that council staff approved this permit. There’s a rail trail for people to ride bikes. It is unconscionable for people to ride through hoodie plover breeding sites as part of their leisure activity. We are privileged to have some of the last hooded plovers on the planet living on our beaches. We have a responsibility to protect them. ​WESTERN Port watchers, tourism operators, environmentalists and the community are all celebrating the record number of whale sightings this year in Western Port. 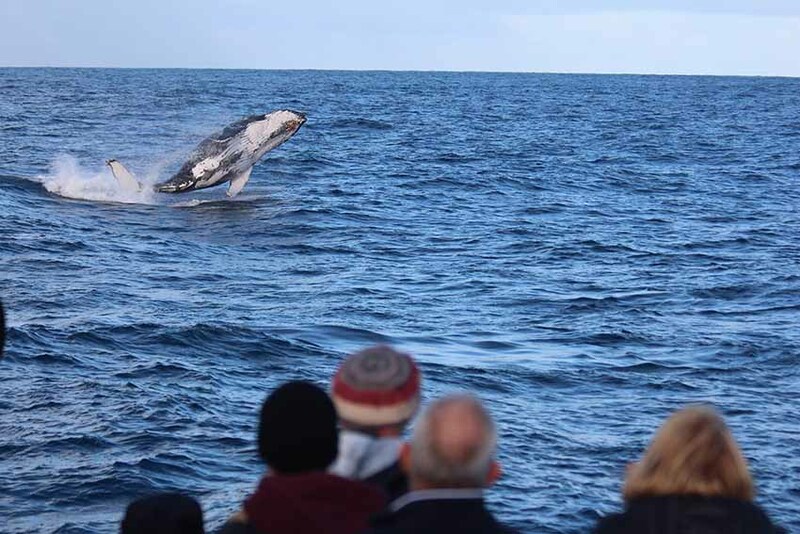 With sightings of more than 110 humpbacks, one southern right and four orcas in the region, whale watching cruises even extended their cruise schedules. Conservationists are also celebrating the recent Phillip Island Nature Parks quarterly bird count that revealed record numbers of sightings and significant sightings of double banded plovers, red necked stints, Caspian terns, godwits, and red-capped plovers at Observation Point. Meanwhile the oil industry and the Port of Hastings are taking advantage of the protected pristine waters of Western Port to park an unwanted oil exploration rig, the West Telesto, just off the Phillip Island coast line near Observation Point for an undefined period of time. The oil rig is owned and operated by Origin Energy and when fully operational costs around $500,000 a day to operate. Hastings Port operator Patrick has refused to disclose the amount of money being received when the rig is parked in Western Port. Currently Western Port has multiple land managers, authorities and community organisations as well as the oil industry and port operators all seeking to achieve different visions. The oil industry and the environment are colliding and this RAMSAR-protected waterway needs protection. The Preserve Western Port Action Group calls on the State Government to initiate holistic master planning to secure and preserve this natural asset and the vast tourist economy it supports from the oil industry and further industrialisation. Jeff Nottle is chairman of the Preserve Western Port Action Group, a sub-committee of the Phillip island Conservation Society. BOB MIDDLETON grieves for a gentle creature brought undone by an apparently never-ending landscape. THERE is an unwritten law in our house that the evening dishes remain in the sink until the next morning. For me the benefits are twofold. 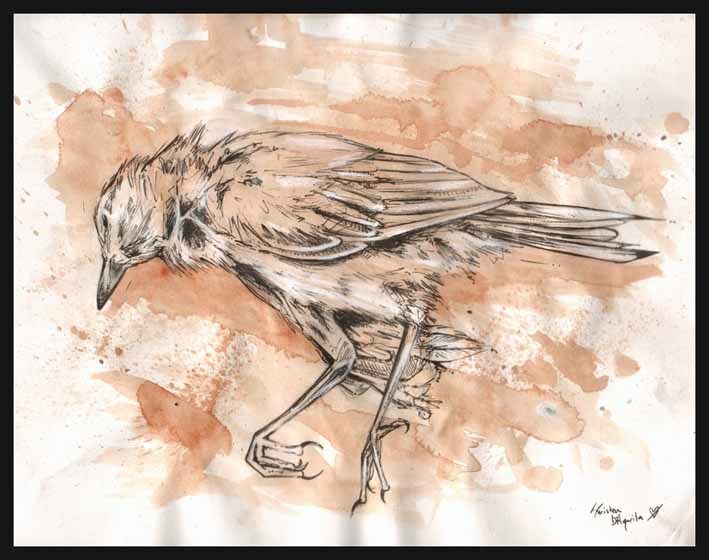 The night time meal signals the close of day and is not to be invaded by additional toil and the following morning wash up becomes my bird watching time. Our kitchen window looks out onto a large and largely unkempt garden that at this time of year is left to have its rambling way. Over the years this part of the garden has become a popular playground for many bird species and has been made even more attractive to them by having bird baths placed in predator safe open areas. By the time the dishes are done I would have usually listed at least six different breeds. Several mornings back, as my attention was drawn from the garden back to the suds, a bird thudded into the window with frightening force. I am sure the window was still quivering as l raised my gaze but to my amazement it was still intact. Years earlier I had sat in the lounge room of a Riverina farm house when a racing pigeon smashed through the window and landed dead at our feet. Our house is mid fifties by birth and as such the glass is much thinner than that allowed by todays building regulations. I think there is little doubt that our victim, like the pigeon, was being pursued. They were flying into a never-ending landscape. How were they to know it was merely a reflection. Outside a crimson rosella, its soft breast feathers drifting down in a cloud of pinks and greys. Eyes still open and still breathing its head lolling at an awkward angle. You could tell it had only a short time left. I went to the wood heap for the axe. My mind pictured the development stages this dying creature had passed through. The pure white egg nestling in the deep hollow of a tree. The hatching, the growth, the everyday battle to survive. That first flight, and now this, the last flight, the fatal headlong collision into an illusion. The next day the gentlest of thuds at the glass door and there lay this beautifully feathered red-browed firetail, wide eyed but with that vacant stunned stare. Still such a tiny and delicate wee thing one would wonder at its chance of survival. I cupped it in my hands to offer warmth then placed it in a shoe box lined with one of my partners possum fur socks and moved it around to the sunny and protected side of the house. Charlie Bones, our pint-sized guard dog, came over and had a gentle sniff until the possum sock owner yelled at him. The firetail was still there 20 minutes later and although it was sort of sitting up now we were not holding out much hope. Even a broken wing would mean the end. Suddenly it was up and away taking to the air with an impressive burst of speed, flying low and true through the orchard without so much as a by your leave. A miracle bundle of red and olive as it disappeared behind the citrus trees. I figure that we get up to a dozen similar accidents a year though rarely fatal. Last month a thornbill hit hard and was dead on impact. We buried him at the base of a large stone bird bath. Not sure I would have done that for a magpie or a raven. The smaller they are the more our hearts bleed. So now we have hung up a loopy banner of Tibetan prayer flags hoping that may protect by breaking up the reflection of what must appear to them a garden yet to be explored or a flight path to safety. IT WAS the end of a long day. Having spent the late afternoon and evening in the living room, hugging the Coonara and peacefully watching TV, it was time for bed. As I stood up, one of my kittens began hurtling round the room. It happens quite a lot, often at bedtime, but this was no ordinary game of chasey. Looking up, I saw what she had already seen – a bat. In the lamplight, this black shape was zooming erratically round and round the room. Now, I’m not scared of bats but let’s say I’m wary of them, remembering vaguely that they carry various diseases I wouldn’t want to catch. Rather than fear, my first reaction was amazement. Where on earth had it come from? I hadn’t been out of the house for hours and my house is a flywire fortress to exclude mozzies and blowies. I quickly closed doors to ensure the visitor couldn’t fly into my bedroom. It seemed to have stopped flying at one point and, when I looked, it was because the same kitten had caught it. She must have caught it in mid-air, but, as I looked in horror, she had a front paw on each batwing, pinning the poor thing to the carpet. Somehow, the bat escaped and continued zooming around the room, mercifully unharmed. Removing the kittens, I thought quickly. I once had a bird fall down the flue into the firebox. I opened doors and windows, before opening the fire’s door and the bird flew straight out the kitchen window. Hoping it would work again, I opened the front door and screen, letting out all the warm air and keeping fingers crossed that every mozzie in the area wouldn’t think it was an open invitation to take up residence. I thought the bat would sense the open flyway and exit like the bird. Come morning, there was no bat to be seen. Obviously, it had to be there somewhere, but where? I thought of ringing the Maru wildlife place to see if they had any handy hints but decided to try to locate Batty first. Bingo. There it was, tucked up on the back of a big mirror, hanging from the top edge of the frame. Making sure the kitties were out of the way and all doors closed, I opened the nearest window and carefully removed the heavy mirror from the wall. Batty must have been sound asleep as it didn’t move during this manoeuvre. I slid the mirror, and Batty, through the window onto the back veranda, which is enclosed with flywire. Slowly, carefully, I eased the mirror through the wire door onto the back steps. Mirror, Batty and I were all now out of the house in the open air. What a relief. At this point I felt able to relax and have a closer look at my visitor. It was my first encounter with any kind of bat. He or she was quite small, with brown fur rather than black and was hanging upside down from two little ‘feet’ with five claws. The wings were folded tight and the head tucked well in. A kookaburra call from the block next door reminded me that Batty was in a pretty vulnerable position in daylight so I moved the mirror onto the front veranda, out of the rain and out of view of any passing predators. Heaving a sigh of relief and wishing Batty well, I then went off to do some gardening before the next shower. When I checked, some time later, Batty had gone. I hope it lives long and prospers, but in the outdoors, where it belongs. Certainly a night to remember for me! Fox-hunters: Stuart Murphy and Craig Bester with Jazz and Sam. PHILLIP Island is one step closer to being fox-free following the removal of a male fox from the coastline near Surf Beach. After the discovery of fresh fox tracks in mud, fox detection dogs Sam and Jazz were deployed to search the surrounding area and Phillip Island Nature Parks’ staff killed the fox as it broke from cover. The fox eradication program started in 2007 in an effort to protect Phillip Island’s biodiversity and wildlife, such as penguins and short-tailed shearwaters, from the introduced threat of the European red fox. Extensive broad-scale fox baiting and monitoring programs, together with overwhelming community support through the ‘Dob-In a Fox’ Program, have resulted in the fox population on Phillip Island being reduced from between 60 and 80 in 2007 to currently less than 10 foxes. 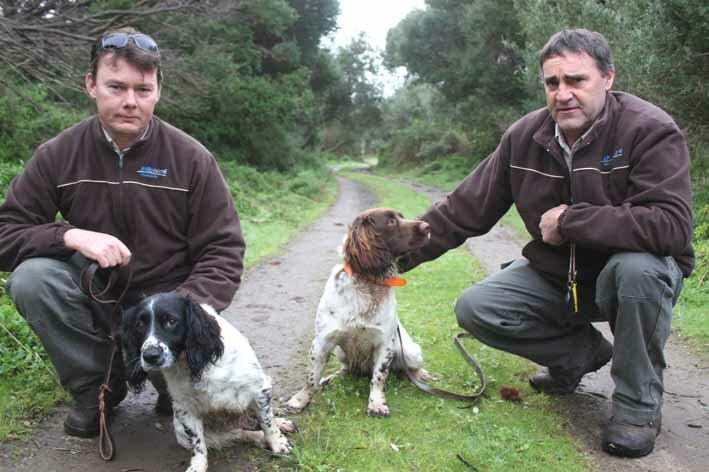 The fox detection dogs have also found fox scats at several locations across the island which were mapped and collected for genetic analysis, allowing a more focussed effort to remove the remaining foxes. Re-installing a surveillance camera, mounted on a pole on the Newhaven side of the bridge. Sightings will be triggered by a series of infra-red beams with photographs relayed to a server and the Fox Hotline. Installing fencing on the northern side of the Phillip Island Road in San Remo. The 1.8 metre fence, installed between the roadside guard rail and the vegetation, will deter foxes from accessing the bridge directly from the adjacent walking track and vegetation. Installing a high-frequency audio device to deter foxes from approaching the bridge at night. Inaudible to humans, this device will be triggered by a series of beams. Creating a buffer zone of low fox numbers through control measures on the Anderson Peninsula to reduce the likelihood of foxes crossing the bridge. If you see a fox on Phillip Island, please phone Phillip Island Nature Parks on 0419 369 365. November 29, 2014 - Linda Cuttriss is entranced by the magpie show on her back lawn. August 30, 2014 - By the 1970s, foxes had wiped out nine of the 10 little penguin colonies on Phillip Island and the world-famous Penguin Parade appeared doomed. Then researchers started doing the sums. Local interest in whales has skyrocketed since Watershed Victoria began keeping records of sightings of these annual visitors to our coast. WHALES have been sighted between Phillip Island and Venus Bay over the past month, signalling that the whale season has well and truly arrived. On Friday, a whale was spotted at First Surf Beach at Cape, cruising slowly down the coast towards Inverloch. Those with patience and a keen eye can expect to see whales around our coast until September or October. For the fourth year, Watershed Victoria is collecting records of whale sightings. This year you can log and view details of sightings at the Whalewatch Gippsland Facebook page phone or SMS details to 0499 293 296 or email info@whalewatchgippsland.com.au. Community interest in local whales has skyrocketed since Watershed Victoria began keeping records of sightings of these wonderful visitors. With four years of details records, there is now no doubt that the South Gippsland coast is an important habitat for at least two species of endangered whales. Phillip Island whale photographer Lisa Schonberg has seen about 200 whales in the past five winters. Already this winter, she has spotted more than a dozen around the island. There is an additional spin-off for the local economy, with more people visiting our coastline during the cooler months in search of one of nature’s great spectacles and discovering what other great things the Bass Coast has to offer. February 21, 2014 - Lisa Schonberg’s five-year labour of love photographing the whales and dolphins of Western Port could prove crucial in the battle against plans for a massive container port at Hastings. Catherine Watson reports. February 15, 2014 - Dog-owners have joined the ranks of those keeping vigil over Red Rocks ' precious hooded plover chicks. Sue Saliba reports. December 5, 2013 - Early each morning Linda Cuttriss is woken by raucous cackling and shrieking. It’s pandemonium, but a welcome one, because it means the shearwaters are back in the breeding business. November 30, 2013 - Local snorkellers followed in the footsteps of Charles Darwin and Benjamin Franklin, citizen scientists of their time, when they went below the surface of Shack Bay. October 13, 2013 - Watching a pair of blue wrens play aerial hopscotch reminded Bob Middleton of other intricate mating rituals. May 26, 2013 - For neighbouring farmers, the periodic flooding of the Powlett estuary is a time of some anxiety. For water birds and freshwater fish, it's a time of full and plenty. January 12, 2013 - After watching a pair of Cape Paterson hooded plovers fail to raise a single chick from four clutches of eggs last summer, Graeme Henry was delighted when two chicks hatched out in early December. He continues the story. The Tasmanian tiger was officially declared extinct in 1986, 50 years after the last known specimen died in the Hobart Zoo. But is it possible a colony has survived in south-west Gippsland? Hobart Zoo, 1936. Photo: Tasmanian Museum. YOU can blame it on Tom Gannon, editor of the Wonthaggi Express. Initially he referred to it simply as “The Animal”. Later he used the name “the Wonthaggi Monster” to describe the unknown animal or animals that periodically mauled stock and terrified humans in south-west Gippsland. The name stuck, even when sightings occurred in the western districts. 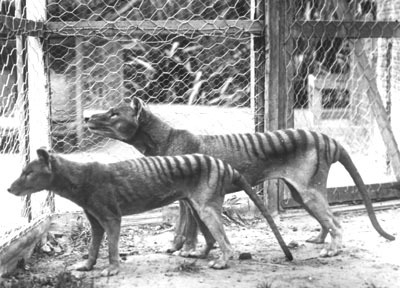 The first local reports appeared in the 1940s, only a few years after the last known Tasmanian tiger – or thylacine – died in the Hobart Zoo, and almost exactly a century after the Tasmanian government put a £1 bounty on them. 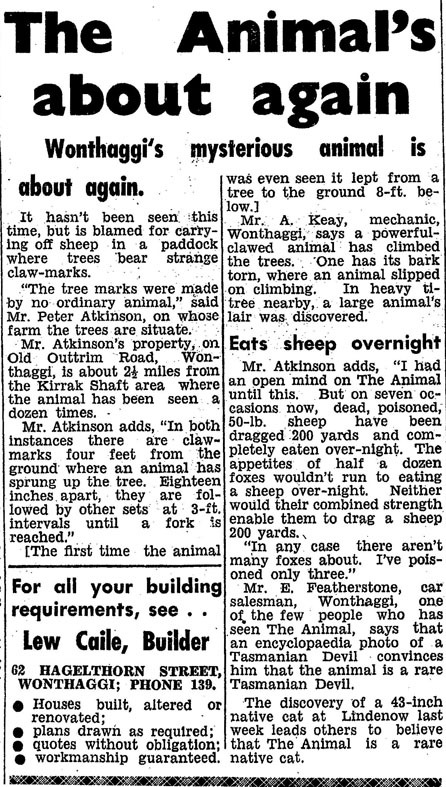 On June 14, 1950, under the headline “The Animal’s about again”, the Express reported, “It hasn’t been seen this time but is blamed for carrying off sheep in a paddock where trees bear strange claw-marks”. Outtrim farmer Peter Atkinson told the Express he’d had an open mind about The Animal until sheep were dragged from the paddock and devoured overnight. “The appetites of half a dozen foxes wouldn’t run to eating a sheep over-night. Neither would their combined strength enable them to drag a sheep 200 yards”. 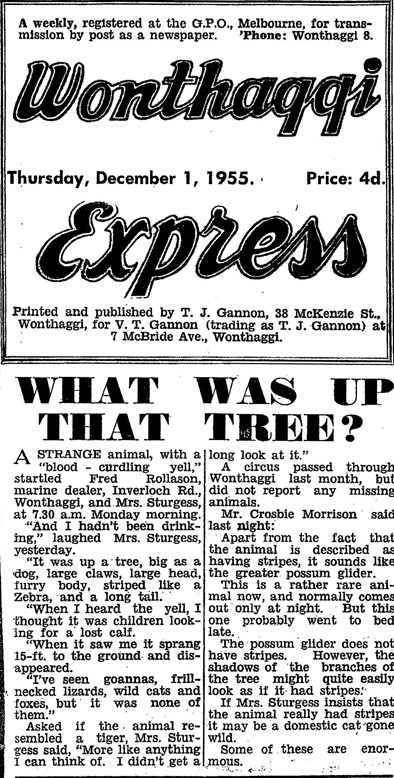 On December 1, 1955, the Express reported “a strange animal, with a blood-curdling yell” springing 15 feet (five metres) from a tree on the Inverloch Road. “It was up a tree, big as a dog, large claws, large head, furry body, striped like a zebra and a long tail,” said Mrs Sturgess, who insisted she had not been drinking when she saw it. Thus began a flurry of activity. “Not since the 1937 mine disaster has Wonthaggi been so startled,” Gannon reported. So numerous were the reports that carloads of men with guns and dogs set out on a tiger hunt to nail the animal or animals once and for all. The editor ventured the opinion that in view of the fact that the animal was obviously very shy, had been in the district for some time and had done no harm, “it would be a matter of regret if it were shot when there is a very real chance of taking it alive”. 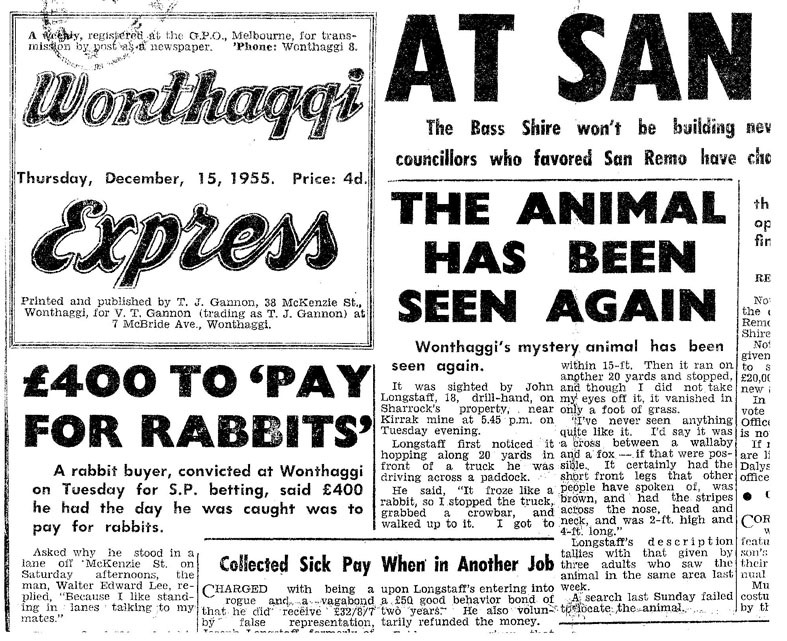 Six months later, the Express carried a report from Melbourne’s Argus newspaper, in which Lindsay Mudge reported, “ Argus photographer Percy Sniden and I made a special trip to Wonthaggi to hunt the mystery animal which has been sighted by a number of people. Fierce barking by our dog warned us that he had roused the quarry but only the dog got a good look at ‘The Monster’. The Wonthaggi Monster was seen again on the Inverloch-Cape Road a month later. “I’d hate to tangle with him,” declared Mr W. Honey, Geelong, afterwards. His companion, retired miner Arthur Lalor, of Reed Crescent, said the animal appeared to come from down near the cliff face. “Big as a big calf, brown like a calf, he had the stripes, unusually long tail and peculiar gait attributed to The Monster”. The latest sighting appeared to overcome Tom Gannon’s scruples about shooting the Monster. 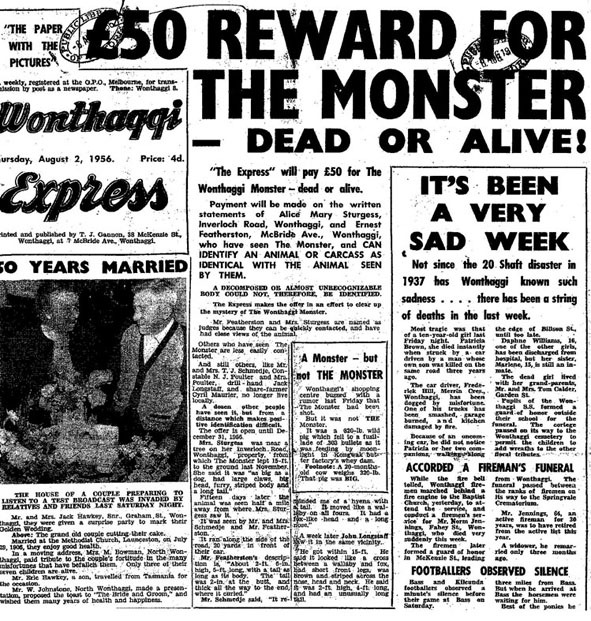 On August 2, 1956, he announced “The Express will pay £50 for The Wonthaggi Monster – dead or alive”. He never had to pay up but sighting continued to be reported well into the 1960s. Melbourne journalist Keith Dunstan noted sardonically that the reports occurred “whenever Tom’s short of news”. Gannon took the scepticism in good spirit. Without a doubt, monster stories were good for circulation, but he also believed something was out there. If he hadn’t, he would surely have offered a £1000 bounty. 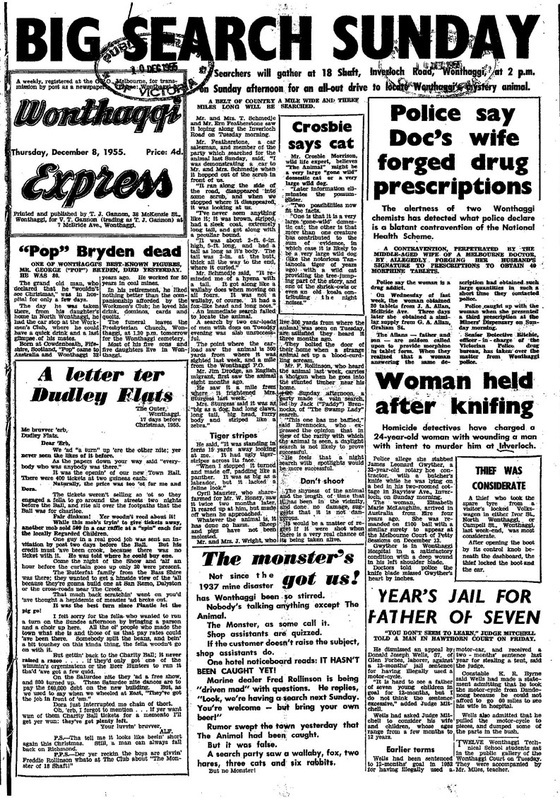 The volume of newspaper reports diminished after the closure of the Express in the late 1960s but occasional reports appear in local newspapers even today. Bass Coast’s own cryptozoologist, Mike Cleeland, believes the “Monster” was an amalgam of everything – Tasmanian tiger, pumas, panthers – and everything else that was living in or wandering through the area. He says there is always a trickle of sightings, and from all parts of south-west Gippsland. The Australian Rare Fauna Research Association has about 200 sightings of tigers from this area over the past 60 years. The accounts differ from one eyewitness to another but two details are constant: vertical stripes on the animals’ hind quarters and its peculiar, clumsy gait. Mike Cleeland first became interested when he saw something in Grantville several decades ago. He says it looked like a Tasmanian tiger except it didn’t have stripes. Since then, he has been on search parties to various sites in Victoria without ever seeing one again. But he believes the sightings should be taken more seriously. In fact he would like to see a scientific investigation funded by the government. Asked what he thinks the chances are of Tasmanian tigers having survived, Mike is optimistic. Take the spade-toothed beaked whale, he says. Until two years ago, it was only known because a couple of bones found on a beach on the Galapagos Islands. No one had even seen one. Then in 2010, two – a mother and a young one – washed up on a beach in New Zealand.